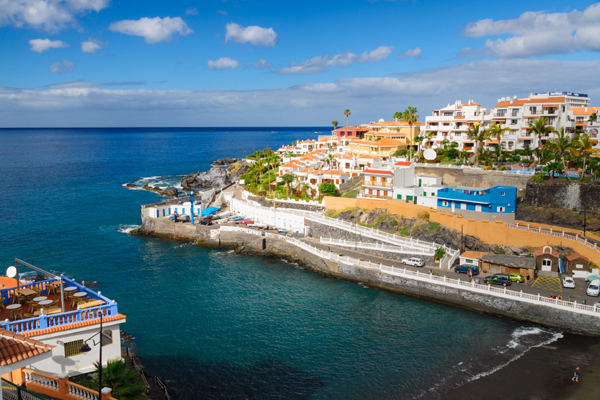 Puerto de Santiago is an emerging tourist resort which nestles on the western coast of Tenerife, sandwiched between the resorts of Los Gigantes and Playa de la Arena. This former fishing village has a handful of bars and restaurants hidden away amongst its winding roads which and boasts a small, volcanic based beach. This ensures that each holidaymaker will experience true Tenerife culture at its most laidback. For those seeking a more lively night out, the resort of Playa de las Americas is a mere 20 minutes away. There are plenty of bars, clubs and nightclubs there to cater for all! There is a beautiful coastal walk linking the resorts of Los Gigantes and Puerto de Santiago which enables the visitors to walk along the promenades and taking in the breathtaking sea views. For a truly relaxing holiday for couples, families and singles too- the resort of Puerto de Santiago makes an ideal base to explore the island of Tenerife. To ensure that all your holiday requirements are met, please feel free to contact our experiences sales consultants who will be more than happy to help.